Coming as very little surprise New Belgium is the top performing B Corp Brewery, however they don't take their role lightly. In preparing the #SustySuds series I learned very quickly that New Belgium are very quick to share their strategies with other brewers and have since helped others access the technology, the information needed to help so many brewers improve on their own sustainability programs. To say that they've been influential is touching on an understatement as their employee owned business has grown to become one of the most recognizable brands in craft brewing and sustainability reporting. If you are unfamiliar with the history of New Belgium, check out this intro video to help understand where this culture of stewardship originated from. SJM - As the B Corp Certification is broad in terms of how you achieve its criteria, what industry specific programs or resources have you used to guide the specific methods you use in your operations? Katie Wallace - New Belgium has prioritized human and planetary well-being since we were founded in 1991, long before many of today’s systems were formalized. Many look to New Belgium for inspiration, what are the resources that helped guide your many efforts? Jack Stack’s Great Game of Business inspired our open book management and then eventually our employee ownership. Along our journey toward 100% Employee Ownership, we’ve relied heavily on the guidance and resources from the National Center for Employee Ownership. We worked with NCEO to create an employee survey we administer every two years. We are a certified World Blu company and have enjoyed many of their resources. We use World Blu’s survey every two years (alternating years with the NCEO survey), and gather valuable insights and tools from that exercise that help us to improve our approach to bringing benefit to coworkers as measured through the B Corp Impact Assessment. In 2007, we formalized our sustainability program by creating a Sustainability Management System (SMS). We hired two local consultants (The Brendle Group andInstitute for the Built Environment) and brought in 17 coworkers from across the brewery. We used GRI, ISO, and several other systems to guide us and landed on a solution that fit well our size and our business model. In 2015 we restructured the SMS. We are members of the Beverage Industry Environmental Roundtable and use their sector guidance documents for our Greenhouse Gas Accounting and Water Footprinting. We also follow WRI’s GHG Protocol for our carbon accounting. We used guidance from the Intergovernmental Panel on Climate Change and Science-based Targets to inform our environmental goals. 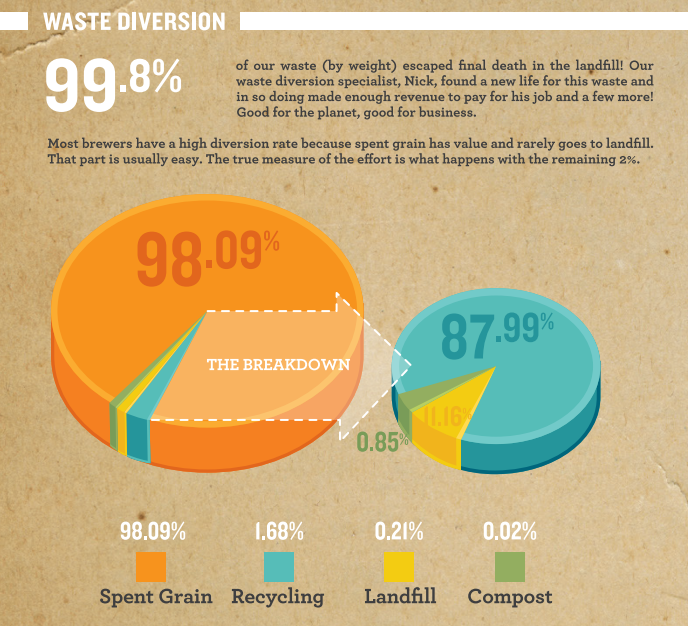 We are a Platinum-level Zero Waste Business and use their resources to improve upon our waste programs. We are a Platinum-level Bike Friendly Business and use their resources to improve upon our bike friendly programs. All of our buildings have been compared to USGBC’s LEED standards and our newbrewery in Asheville will be announcing certification this Spring. We are members of CERES and the American Sustainable Business Council and have been very active in advocating for climate-friendly and worker-friendly policies. According to the Brewers Association, many craft brewers are around 7 barrels of water for one barrel of beer, do you measure this ratio at your brewery and if so what is your current performance at? Yes, per the BIER and BA measurement standard, we measure total water purchased (includes water for brewing, kitchens, bathrooms, landscape) and divide that by total beer packaged. Our water use ratio is 4.00:1. Do you consider this an important performance indicator? Yes, especially in arid Colorado, measuring our water use is extremely important. With beer being over 90% water, we consider it the lifeblood of our business. Our water use ratio and our corporate greenhouse gas emissions are our two most important environmental metrics. How does this guide your investments into future equipment/infrastructure? Our sustainability metrics are included as KPI’s in our highest level of our business strategy. Daily management toward goals in the realm of equipment/infrastructure investments: Our overarching Project Governance system (which evaluates and approves funding and worker time to every major project) requires project managers to report on impacts to the brewery’s water consumption and greenhouse gas emissions. That criteria is reviewed as projects are evaluated and project managers report on performance to the best of their ability (not all things can be accurately measured, but we do our best to include it and I’m personally impressed with the dedication most of our project managers show toward our water and GHG reduction goals). Strategic management toward goals in the realm of equipment/infrastructure investments: We also have a 5-year sustainability plan that was co-created by our Natural Resource Management Team, a team of 12 or so people from sustainability, operations, maintenance, engineering, EH&S, purchasing, and public relations. Together this team identified specific reduction projects that would help us reach our water and GHG reduction goals, and we modeled their reduction potential and cost as to have an exact plan to reach our stated goals. One-time use beer containers contribute to roughly 40% of the annual GHG emissions associated with our beer. In 2016, we cofounded the Glass Recycling Coalition and are dedicating time and leadership in that group to improve glass recycling within the U.S.. For every 10% increase in recycled content in glass bottles, a 3-5% decrease in GHG emissions is realized (though this is negated if you ship the recycled glass long distances). For a truly drastic decrease in package-related GHG emissions, we would need to see returnable bottles reinstated nationwide. It will be interesting to watch Bayern Brewing in Montana to see if their returnable bottle program inspires similar movements. Water reuse in Colorado has been illegal for a long time, but some of these laws are changing as to better cater to water conservation and sustainability. We are piloting reuse programs in which we will use our treated water for irrigation on site and as water to flow through our cooling towers. Our local sales and delivery fleets decreased their GHG emissions per mile by 53% by switching to electric vehicles and hybrid vehicles as well as hybrid delivery trucks. The hybrid delivery trucks have worked very well for us over the past few years. Unfortunately, however, national demand for them has decreased with lower oil prices. At this point, we’re not able to lease any new hybrid delivery trucks. I hope we see this offering return and that hydrogen fuel cell-powered vehicles continue to move closer to the general market. New Belgium's Performance in Water, Emissions and Waste. 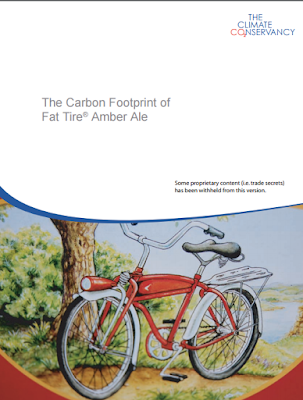 2011 A look at how New Belgium Brewing is implementing Environmental Stewardship in their brewing operations. A look at how Riverbend Malt House and New Belgium teamed up.